Francesco Di Rosa was born at Montegranaro (Italy) in 1967. Since 1995, he has been principal oboist of the « Scala Theatre Orchestra » in Milan and of the « Scala Philharmonic ». At a very early age he began to study piano and at 11 started the oboe with F. Fabrizzioli and L. Franca. He gained his diploma with distinction at the Conservatoire G. Rossini in Pesaro in 1986. Later he attended master classes with Maurice Bourgue at the « Scuola di Alto Perfezionamento Musicale » at Saluzzo. Amongst the many prizes won in his career are the 2nd price at the European Oboe Competition in Zurich in 1988 and five other prizes in national chamber music competition for oboe and piano duo. 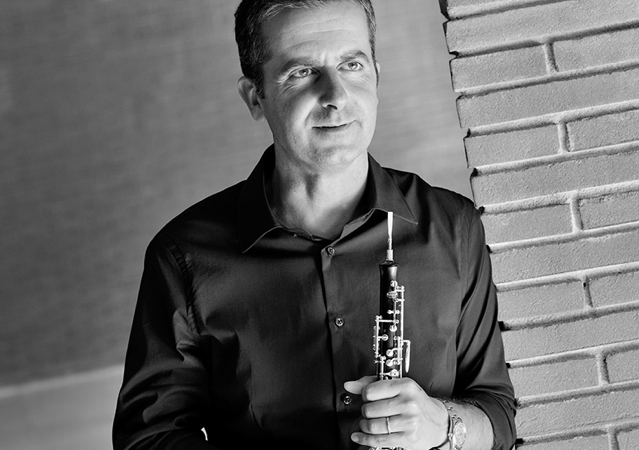 He has also won competitions and auditions as principal oboist with the major Italian orchestras. He has given many concerts as soloist in Italy and abroad in prestigious concerts halls (amongst others the Tonhalle in Zurich, the Musikhalle in Hamburg and the Scala Theatre in Milan) with Simphoniker Orchester Zurich, the Jugend-Orchester Amburg, the Orchestra Filarmonica della Scala conducted by Riccardo Muti, the Camerata Academia Saltzburg, etc. With Riccardo Muti and the « Scala Philharmonic » he has recorded Mozart’s Sinfonia Concertante for EMI, with I Solisti della Scala Beethoveen’s Quintet for Tymallus of Milan; with the Briccialdi quintet quintets by Danzi, Cambini and Birccialdi; and the double oboe concerto by T. Albinoni with the Offerta Musicale for Bongiovanni of Bologna. He has taught oboe the Frescobaldi Conservatoire of Ferrara and the San Pietro a Majella Conservatoire in Naples. He now teaches at the Scala Academy in Milan and at the Rolla Academy in Pavia. He holds advanced courses and master classes; he is regularly invited to seat on national and international juries.